In the spring of 1864, Grant began his Overland Campaign to destroy Lee's Army of Northern Virginia. When Grant and the Army of the Potomac under Meade failed to move quickly through the Wilderness, Lee pounced on the Yankees there since Union artillery superiority would be largely negated. The fighting stagnated, but instead of retreating, Grant continued to move south. Lee picked up on the threat and started his army south as well. Because there was nowhere to camp in the burning Wilderness, and because of the awful smell of burning human flesh, Longstreet's First Corps, now under Richard H. Anderson, continued to march at night. 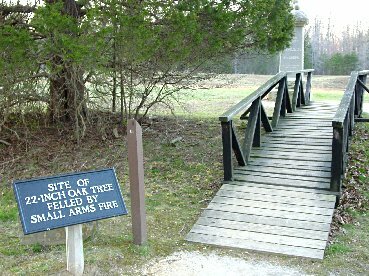 On May 8th, due in part to the delaying actions of Confederate cavalry, Anderson was able to block the road to Spotsylvania Courthouse before Warren's V Corps could reach the crossroads. Thinking that he was facing only Confederate cavalry, and perhaps in reaction to his slow performance in the Wilderness, Warren ordered hasty piecemeal attacks at the Spindle Farm, or Laurel Hill, which failed with heavy losses. Both armies concentrated and entrenched. On May 9th while visiting his entrenching front line troops, Gen. Sedgwick tried to shame his cautious soldiers, telling them that the Confederates couldn't hit an elephant at that distance. He was promptly killed, and Horatio Wright took over command of the VI Corps. Meanwhile, in reaction to friction between Meade and the cavalry commander, Phil Sheridan, Grant detached his cavalry to raid toward Richmond. Lee was forced to detach much of his cavalry as well, and this left both commanders largely in the dark about their opponents. On the 9th and 10th, Hancock's II Corps moved on Lee's left flank, but pulled back after some skirmishing. Hancock was lucky not to have faced disaster, as he had the Po River to his back. At 4 P.M. on the 10th, the V Corps under Warren attacked the fortifications to its front, but they were easily repulsed. To Warren's left, Col. Emory Upton of Wright's VI Corps would to lead an attack on the large Confederate salient known as the Mule Shoe.